People often can't agree on a regular wall A/C temperature and they have to share it with the whole office: now you can have your personal cooling device. Evapolar automatically creates the most comfortable climate for a person working like your personal small lake that creates a natural breeze, it spreads coolness smoothly the same way air is cooling in nature. 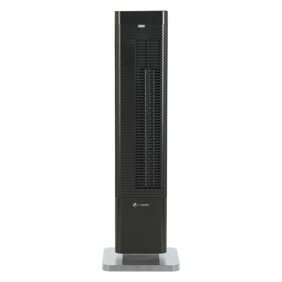 Since Evapolar is an evaporative air cooler, it takes hot and dry air and makes it cool and moist. Inside, an innovative fully organic material that inhibits the growth of mould or bacteria. Materials are easily recyclable and don't deal any harm to the environment, doesn't need freon or any other toxic coolant . The most efficient air cooler of this type, no other devices are able to give that cooling performance in such small size. This material is fully biodegradable and, together with low power consumption, makes it green and eco-friendly. My mom has terminal cancer and COPD, so clean air is imperative. Unfortunately, she lives in a house built in the late 1800s, so there are air quality issues built in. This air purifier seems to have really helped clean the air in the main areas if her breathing tests are any indication. I am happy with this portable Air Conditioner. It has done the job tremendously. I have been reading where people are having trouble with the drain hose situation. I have had mine for 6 months and during the hottest part of the summer, (July-August) I have yet to drain it. The manual says it will beep 6 times when it needs drained. Well I have yet to hear it beep yet. It probably will today since I am mentioning it. LOL! Fall is here so I will put it away soon for the next summer. So thankful I bought it! I suffered 2 years in my bedroom and this year slept like a baby! I have also noticed people complaining about noise. It is a fan operated unit. It's to be expected. I kind of like the sound at night. I depends on the person though. It blocks out I-5! (Interstate) where I live in Orange County. In this Louisiana heat it cooled the room I was in until my A/C was fixed. but I will say the foundation will buckle if the machine is in extreme heat which will cause it to leak from the sides other than that it was a great investment. I use this Air Cooler on my boat and in my office. It really does cool you off if you are right next to it. Its designed to cool a small space. Very Happy with it. Watch is beautiful so comfortable I don't even know I have a watch everyone loves it! Easy hookup no problems works great here in 115 heat in dallas. I bought this for my husband to use in his office. Although it did cool the air with a pleasant amount of humidity, it also had a loud, high-pitched hum while it was running. Ultimately, I had to return it. This system does cool but you have to have to be within 2 ft of it to feel anything. The water runs our fast, and there's no on/off button. You have to keep unplugging it. Disappointed for as much money as this cost. Would not recommend. Is the filter washable? Or do I have to buy new filters? 1. This product has no filters. no on and off button ? how big is the water resivor ?